The past few weeks have been dry and hot, temperatures nearing the 100's (F) with cool nights. Though many plants are in bloom, it seems to be a transitional period between the Spring flowering plants and the Summer bloomers. Many, including this wild rose, have all but stopped flowering by the time this is posted, mainly because the intense heat we've experienced had hastened the life of the flowers. This phenomenon has been apparent to me this year when I observed the earliest Narcissus flowers lasting at least two weeks, while the latest (Narcissus poeticus) lasting a matter of two or three warm days. No matter, insect and animal pollinators have been busy at work feeding, collecting, and foraging for their own survival and to feed their young. This wild rose, a possible hybrid between native or nonnative species, grows out in the field behind our house. Bees are very fond of it, as are a variety of other insects. It is unclear whether roses actually produce nectar like other members in their family (Prunus, Malus, etc. 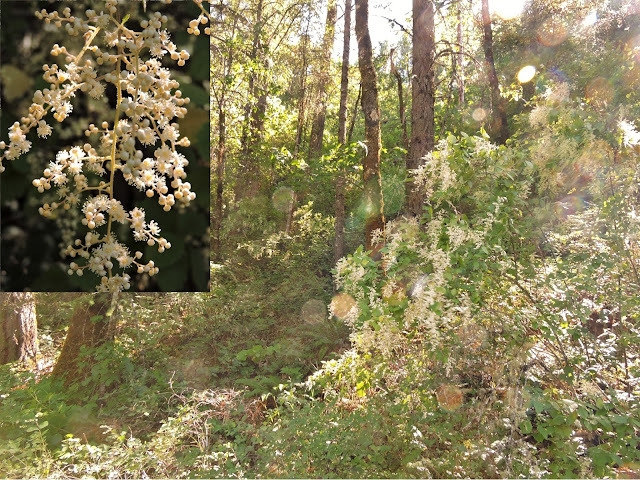 ), but they do produce pollen in abundance as well as the fragrant floral oils. The doubled hybrid roses of horticulture are far less useful to pollinators for a few reasons. First, some have so many extra petals that it becomes mechanically difficult or impossible for all but the largest bees to pry open and enter. Second, consider that the extra petals of "double" flowers are actually caused by a mutation of the reproductive parts (usually the male parts) causing petals to form in the place of stamens. Looking at the photos above, imagine all the stamens being instead replaced by petals, and voila, a double flower, with less pollen available for the pollinators. The native "sunflowers", Wyethia is a perennial herb that grows to be about two feet tall when in flower. They grow in hot sunny sites among grasses and other herbs. The three inch wide flowers seem to attract little in the way of masses of pollinators, though I have seen over the years a small variety of bees visit them (though no honeybees). This beetle was the first non-bee I have seen on it, photographed early in the morning. The temp was fairly cool, and there was a layer of dew on everything. I suspect the beetle was sleeping here. California poppies are common here, both as a weed and a wildflower. I am hesitant to call them "californica" simply because there are many species and I cannot reliably tell them apart. It also seems the plants are quite variable in appearance, advancing my confusion. Here I stumbled upon a spider and what I assume is its recently drained prey, a dead bee. Bees have been surprisingly difficult to photograph in these flowers, I wonder if the flower somehow cues the insects to my presence by reflecting some sort of indicator that I am hovering above attempting to catch them in the act with my camera. A hairy beetle was clambering through the stamens of this flower. Beetles are fascinating pollinators, exhibiting a wide array of shapes and sizes, as well as motives for being in the flower. Many congregate on or in flowers to mate or for shelter, while others are there to eat. Some beetles eat the flower itself (and of these, some are actually pollinating the flowers despite destroying them), while some eat the pollen. Very few beetles forage for nectar. This beetle is somewhat hairy, suggesting to me that it would be a fine pollinator, able to inadvertently move pollen from one flower to the next. While they tend to visit fewer flowers than bees, the presence of hair on their bodies must greatly increase their efficiency as pollen vectors. Syrphid flies are the only flies I have observed interested in pollen. Fortunately, pollen is produced in abundance by CA poppies. It is unclear whether the flowers produce any nectar. The photo does not do the scene justice, the orange and yellow flowers do not record properly. My two blue beehives are in the distance, though I have yet to see any honeybees visit CA poppies in the five or so years my wife and I have lived here. Another orange flower, native to the garden but not the native landscape, Calendula begins its long year of bloom. The flowers seem to be second rate to many pollinators, only being visited sporadically by bees and normally when there is a drop in flower production by surrounding species of plants. Lately, I have seen multitudes of these tiny beetle-like insects on most of the flowers in bloom now. Calendula are well suited to small insects because of the multitude of small shallow florets located in the middle. Related to sunflowers, Calendula flowers are composites being comprised of many tiny flowers together. The "petals" are actually modified (often sterile) ray florets, while the center is comprised of the fertile disk florets. Each fertile floret has its own stamen and pistol, its own ovary, and will produce a single seed. Driving home the past week I've seen these beautiful shrubs growing on the moist shady west facing bank which leads to Evans Creek (which then joins the Rogue River). The plants are oceanspray, aptly named by the wispy flower clusters. There are a lot of forest plants growing on this bank, including Trillium ovatum, Aquilegia formosa, and a variety of others. Despite the wind and the poor light, I managed to snap a few somewhat decent pictures. Being on the side of the road, the wind blew like a hurricane every time a car drove past, making the endeavour a frustrating one. 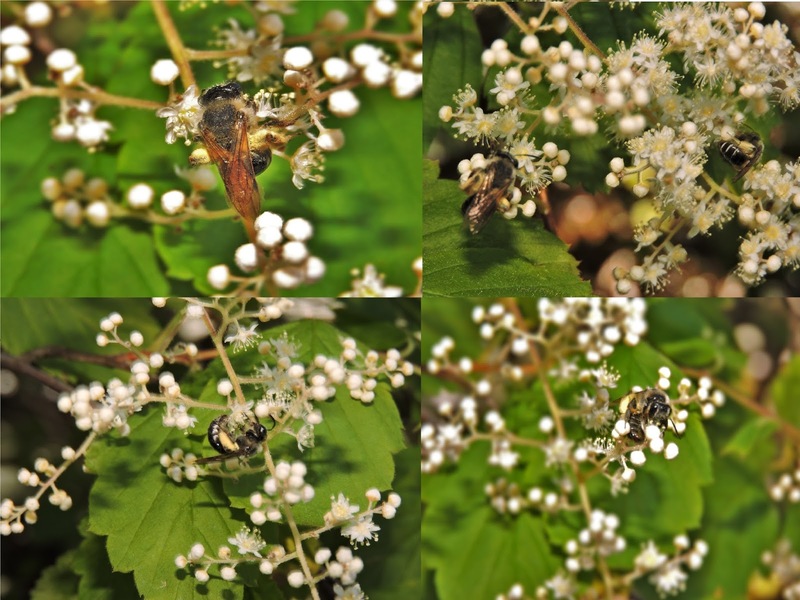 These small bees were the most common, and very active on the plants. They appeared to be collecting both pollen and nectar. Other small insects were present, such as small beetles and flies. Pacific ninebark, otherwise known as Physoparpus capitatus, grows in shaded moist areas at the forest edge, also commonly on the side of the road (a man made forest margin). Many of the floral visitors I saw at the time were mosquitoes, beetles, and other tiny insects like gnats and tiny beetles. These are large shrubs or trees, sometimes somewhat sprawling in habit with stems struggling to stay up from the weight of their own growth. Yarrow is blooming now. The two to four foot sunflower relatives are a good source of nectar and pollen for many short-tongued pollinators. In this photo is a syrphid fly, a small beetle, and a pair of mosquitoes, each working their own personal flower. The last of the "themids" (currently in the family Brodioideae, formerly "Themidaceae" which was based on the defunct genus Themis), Brodiaea elegans is the largest flowered of the family in this region, Dichelostemma having the smallest flowers and Triteleia being somewhere inbetween. Despite the mass of flowering in some locations, pollinator visitation has appeared low. Besides this single observation of small beetles inside this flower, I have observed a single butterfly visit a flower. I have seen small bees visit the flowers in years past, but none this year. On a nearby roadside bank that hosts a wide variety of other wildflowers, there is a large population of hundreds of individuals of Brodiaea elegans. As mentioned above, despite the large numbers, pollinator visitation has appeared low. This could just be due to lack of observations at the right time of day, all my observations out of necessity have been at the end of the day. It is possible, likely even, that they receive the most visits from bees (if at all) in the earlier part of the day before it gets to be too hot outside. Bees can easily die of dehydration, and on the hottest of days will be less active. This has appeared particularly true of native solitary bees, less so of the large Xylocopa and Bombus bees. This small Campanula has received little to no visitation in years past, though this appears to be changing. This year marks the third year it has been in this location in my small rock garden. It has attained a larger size this year, and has so far been more floriferous than ever! Almost every flower contains small beetle-like insects like the one in the upper center, and I was lucky to catch a tiny bee in the act inside of this flower (just left of the center). Living up to its reputation, Echium vulgare (or, for some reason, vipers bugloss) has been an excellent bee plant. It is not uncommon to see three or four bees working the plant at a time. Bumblebees and Xylocopa bees, large and able to generate their own warmth, will work this plant until dusk. Echium vulgare grows between two and five feet high (I have a tall individual growing in a somewhat shaded site, it grows tall looking for the sun), and about two feet wide. When grown from seed, it produces a basal rosette of leaves the first year, flowering the second. It is said to be a short lived perennial, or biennial, so only time will tell how long it will survive in my garden. The presence of toxic alkaloids, or possibly the hairy leaves (typical of members of the family Boraginaceae) are unappetizing to deer, who have left the plants alone. Besides honeybees and bumblebees, a variety of small solitary bees have flocked to these plants. This one, similar in size to a honeybee, was too fast to get a better photograph. This bee is apparently diving for the nectar which is produced in abundance, and is protected by dense hairs (trichomes) in the flower tube. These hairs protect the nectar from evaporation and exclude smaller insects from gaining access to it. Flies remain the most common visitors to the creeping thyme. On one afternoon, the scent given off from the flowers was reminiscent of dog poo, though on a closer sniff it was of a floral nature. Peculiar! Not to say that it smells like crap, these plants are still good in the garden and will not make your yard smell like poop. The most common visitors of the flies are what I have narrowed down to be tachinid flies, large, sometimes parasitic (of arthropods, don't worry), pollen and nectar eating flies. I have seen around five of these large flies, larger than typical houseflies, on the creeping thyme at a time. While photographing the creeping thyme, I was crouched down to get a better angle. Then I heard the characteristic "hum/whizz" of a hummingbird above my head, and there it was! Anchusa azurea, a large forget-me-not type plant in the Boraginaceae, shares the raised bed with the creeping thyme. I have seen hummingbirds visit the plants on numerous occasions, but I never had a good opportunity to photograph them. Contradictory to the theory of pollination syndromes, these hummingbirds are visiting a plant that doesn't have red tubular flowers, though the blue flowers do produce a fair amount of nectar. I have observed, with many of the plants in my garden that are in the family Boraginaceae (Borago, Pulmonaria, Cynoglossum, etc.) that the newly opened flowers are pinkish, or magenta. I wonder if the "reddishness" is still visible to the birds after the flowers turn blue? You say the alien Viper's Bugoloss - Echium vulgare has been good for the pollinators. I say it pulls pollinators from the natives that need it. Actually Stewart, there is evidence to support the theory that a diversity of pollinator forage (including nonnatives) will in fact boost both native bee and native plant communities populations. Also, native bees, unlike honeybees, will continue to forage on the native plants even when other (nonnative) food sources are abundant. The Xerxes Society has documented studies on this subject in their book, "Attracting Native Pollinators". I would also add that your hummingbird is a RUFOUS HUMMINGBIRD, showing a rust or "rufous" color on its sides and rump, I would count it as extra special. I just saw my first Rufous Hummingbird for years in Seattle. I suspect it is in a pre-migratory, post breeding, wandering stage, rather than having nested here. Since the Anna's Hummingbirds arrived here in Seattle, in a long, gradual, northward expansion from Northern California, we have seen fewer and fewer Rufous Hummers during breeding season. I don't know if it is directly from somehow being pushed out by Anna's, or if it is some other cause. Then if it is being pushed out by the Anna's hummers, I'd love to know the mechanism. Do Anna's just treat them like another Anna's hummer and chase them out of their terrritories, and usually win the battle? We are enjoying each report that you write here Travis. Always very informative.